ABAP Programming Model for SAP Fiori (Draft based) for NON GUID Keys & Much more.. This blog is about creating a Transactional capable(Draft) Fiori application using the SAP ABAP Programming model for SAP Fiori with end-to-end till saving to db. This gives some technical insights, information & links about the draft framework. This uses the same example from the SAP help but instead of the GUIDs for the key fields, it uses the normal fields as most of the legacy solutions are not based on the GUIDs or a fresh Greenfield solution. So it will be easy for you guys to map the differences between GUID(help) & NON GUID draft application(this blog). I will also discuss about an issue that we usually face while doing this NON GUID key based scenario. I recommend you guys to check the blog by Diego Borja on draft enabled Fiori app for the custom/standard tables. This is targeted for the people who have a basic knowledge in CDS views, OOABAP & Fiori and helps to kick start your development in this new framework. The ABAP programming model for SAP Fiori defines the architecture for efficient end-to-end development of intrinsically SAP HANA-optimized Fiori apps in SAP S/4HANA. It supports the development of all types of Fiori applications like transactional, search, analytics and planning apps and is based on customer-proven technologies and frameworks such as Core Data Services (CDS) for defining semantically rich data models, OData protocol, ABAP-based application services for custom logic and SAPUI5-based user interface. For more information about this new programming model, check the SAP Help. You cannot create an item and its subitems at the same time. e.g., you cannot create the sales order header and it’s item at the same time. You have to save the header first and later you have to create the items one by one. You cannot dynamically make the fields visible/hidden/editable/readonly. It has very limited field control capabilities. Exclusive locking like the locking in GUI/Webdynpro applications is not available. Context depended search help is not there.. e.g., if you enter a country, you need to show only that entered country states, this is not possible. If we develop the apps with Draft capabilities, then we will have all the above and much more awesome features. So what is this “Draft”..? Like the name “Draft” suggests, It’s something that is not final, its just a temporary version. When we create or edit an entry in the Draft enabled Fiori app, an entry is created in the draft table(which is configured in the CDS view). When we enter any data in the inputs, a request will go and save the data to the draft table. So even after refreshing the browser, the data which we entered before refreshing the Fiori app in the edit mode will be retrieved back. What we will get by using this so called “Draft” features while developing the new Fiori apps. Now of course the “Draft” feature itself- Data loss protection. Device Switch: So using this, you can start on one device(laptop) and continue the changes on another device(mobile/tablet). The above image is taken from the SAP UI5 documentation, link available below. It has a very good information about the draft features. Draft data: temporary data(copy of active data with the new changes)., which will be removed after the final save. Taking the BP example here. First if we open an existing BP and click on Edit, it will create the draft version for the actual version and from here on, all the changes you do there will be saved in the draft version. If we open the role of the business partner and change some data there, roles data will be saved in the role draft table. So after clicking on the SAVE, it will save all the data from the draft version to the active version and deletes the draft entries. This draft table is not the actual table, it is the copy of the original table, which we will define in the CDS view. 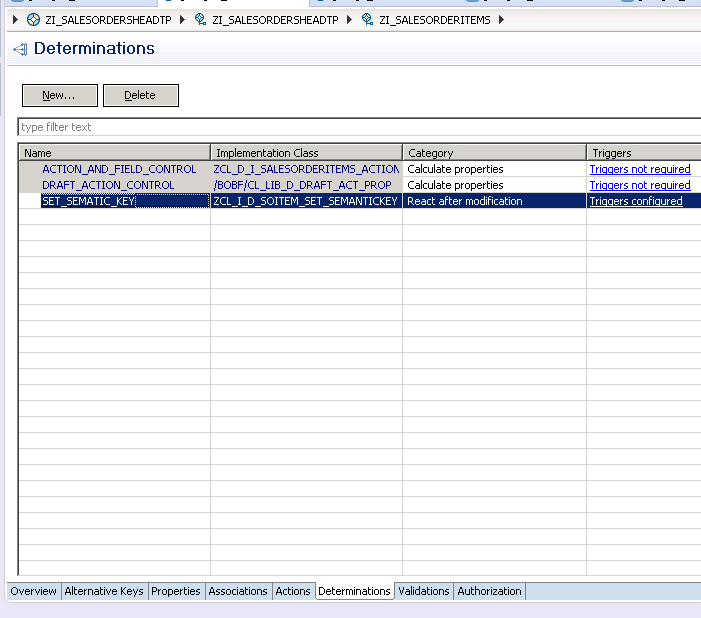 BTW we do not need to create this table manually, SAP will create it automatically when the CDS view is generated. Create the “Transactional” type CDS view which will be draft enabled. Here we will just mention the draft table name, SAP framework will create the draft table automatically based on the CDS view. To be frank, there is no big difference between the draft & non draft in terms of development for us, it’s mostly taken care by SAP 🙂 but the main difference comes in terms of functionality. Now let’s see the development part of it. This example will be very similar to the one that was provided in the help, please check the help links that I’ve provided first before going through this. The only thing that changes in this is instead of using the GUID as the key field, I will use a normal character field. Before going to the Development part, let’s see a small demo of it. Let’s create 2 new custom tables. ( we can use your existing custom tables or standard tables ). We create the base CDS views to fetch the data from the actual database tables, we usually put the logic in these views like doing some conversions or calculations or text changes or writing some join and fetching any data if required. But here in our case we won’t do anything as this is just a basic app. To enable the draft functionality and Transnational processing. The ObjectModel annotations provides the draft & transactional capabilities to the CDS view. The above two will tell that CDS view has transaction processing is enabled and this particular CDS view is the root view(top level view). The above two will tell that the CDS view is having the draft capabilities and we will just propose a draft table name. The draft table will be auto generated when the view is activated. semanticKey tells the SAP framework what the key is, it is used mostly for the CDS views which were developed using the GUID as the key field. Using this SAP will understand what the actual key is instead of the GUID. This is also used by the List template UI5 application to show “Draft” status under the column in the List report app, which it identifies based on the semantickey. So this is better to give for all the CDS views. This will make the tell the view that the column is be readonly. 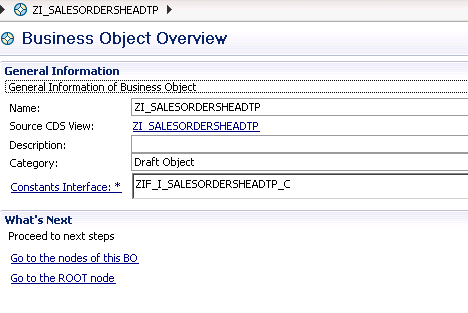 This will create the association from sales order header to sales order items in the Business Object. Here we just need to mention the draftpersistance table and we do not need to mention the draftEnabled and transactionalProcessingEnabled as the parent view takes this child view data and use it in the BO. Other things are same as the above, we just need to mention the association to the parent and the root. So after create the associations and all add the object model to both the header and item cds view and activate them, this will create the BOPF BO and the Draft tables. How to check the created BO? 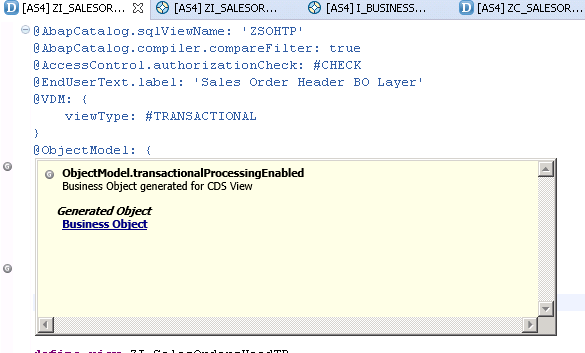 Just hover on the header CDS view, where the “transactionalProcessingEnabled” is set as true. Now click on the Business Object, which will navigate to the BO. Now click on the “Go to the ROOT node” and open the Draft class that is generated. So what happens is that when we click on create button in the Fiori app, a draft entry will be created in the auto generated “Draft Table”. Then if we enter any of the data in the fiori app, it will saved to the draft table. So what we need to do is to write the code to save the Draft data from the draft table to the Actual DB tables. To do this, we need to implement the code for the method: copy_draft_to_active_entity. I’ve provide comments inside the code to understand what is going on. The below code will take care of the create and update scenarios. I am using the direct DB updates, instead you can use the BAPI or Update FMs. DATA(lt_header) = VALUE ztisalesordersheadtp( ). DATA(lt_items) = VALUE ztisalesorderitems( ). DATA(ls_so_header) = CORRESPONDING zso_head( lt_header[ 1 ] ). GET TIME STAMP FIELD ls_so_header-changedat. IF ls_so_header-salesorder IS NOT INITIAL. GET TIME STAMP FIELD ls_so_header-createdat. lt_items_save TYPE TABLE OF zso_items.
" Setting the item number here. LOOP AT lt_items REFERENCE INTO DATA(lo_item) WHERE hasactiveentity EQ abap_false. lt_items_save = CORRESPONDING #( lt_items ). IF lt_items_save IS NOT INITIAL. MODIFY zso_items FROM TABLE lt_items_save. DATA(lr_key_util) = /bobf/cl_lib_legacy_key=>get_instance( zif_i_salesordersheadtp_c=>sc_bo_key ). APPEND VALUE #( draft = it_draft_key[ 1 ]-key active = lv_bobf_key ) TO et_key_link. When it comes to Update scenario(Sales order is already created and saved) and if you try to create the new sales order items, the items will be added but will not be displayed in the Fiori app till we save it to the database. This issue is coming because the framework will not know copy the “SalesOrderNo” from header to the newly created “Draft SO Item”. So we have to update the draft entry with the salesorder number manually in the code. Then the app will understand that the SO item belongs to the SO header. For the Create scenario, it will not happen. To fix this, we need to create a determination for the BOPF BO sales order item. So this determination will be called at the time of create and update. BTW I found this solution in the Standard BP Fiori App which also uses the non GUID key fields. The code is provided with enough comments to understand. READ TABLE lt_items REFERENCE INTO DATA(lo_item) INDEX 1.
lo_item->salesorder = lt_header[ key = lo_item->parent_key ]-salesorder. Go to the auto generated class and write the code to delete the sales order.
" For draft deletion the framework wil take care, for active, we need to. CHECK lt_active_bopf_keys IS NOT INITIAL. DATA(ls_header) = VALUE zsk_isalesordersheadtp_active(  ). IMPORTING es_active_document_key = ls_header ). DELETE FROM zso_head WHERE salesorder = ls_header-salesorder. DELETE FROM zso_items WHERE salesorder = ls_header-salesorder. So till here we completed the business object logic. Now lets see how to create the odata service and generate the Fiori app. Create the Consumption CDS views for both the header and the items. It is mandatory to mention the ObjectModel & Associations again here as they are utilized for the Odata service generation. This is because they both are having View scope, this documentation you can find in the help. CDS rule: Remember to double-maintain the annotations that have the VIEW scope. In CDS views, only the annotations with ELEMENT and ASSIOCIATION scope are inherited from the business object view. Line item position is to for showing the item in the table and identification position is to show the it i the form, when opened. This will auto create the Odata service for us. Now active both the views, which will create the odata service. We just need to go to the /n/IWFND/MAINT_SERVICE and register the odata service. So now the consumption view part is done, so we just need to use the webide to generate the list report app from the odata service that we just registered. There are a lot of blogs out there where they show the process of generating the app based on the template using the webide. Now run the app, which will be same as the app that was shown in the above video. I strongly recommend you guys to try out the example in the SAP help as well. It has very good documentation(especially for the GUID keys based). Please let me know if you have any questions. Also, check out my other blog on “Durable Locks”. Excellent blog, I was looking for this kind of solution quite some time, where in we can use CDS-BOPF for Standard table where guide is not maintained. As using annotation Object Model we can use BOPF draft concept in smart template(Fiori Element), but my doubt here is if we are not using UI5 ot FIORI framework instead of that if one is using Dot net then Is there is any work around for draft, create and delete functionality only by giving CDS view service name which is generated odata service via annotation. Looking for some alternative solution. Achieving draft is easy in the fiori list report template app as it does all the frontend work you like sending the requests on change of ui elements(In the draft version) and when clicked on save, it will save the draft data to actual db. So to do this first you need to open the network tab and see what are the requests that will go when you click on new button. First a create request will go to create the draft entry. After that whatever the changes you do in the UI, asynchronous without blocking the UI, draft entry update requests will go to the backend and will be updated in the draft entry. On click of save, a funciton import call(don’t rememeber for sure) will go and copy the data to the DB(your draft to active entry method will be called). So just go through the network tab and provide all the request to the .net people and tell them how to save the draft entry everytime a change is made in the UI, which would do the job. Thanks Mahesh for that quick reply, even though I read today only. So one have to first build app in fiori and then need to check by pressing F12(about all the calls) or there is any other alternative. Want to build same draft in .net. Yeah.. I think that is the only and easiest way. SAP didn’t provide any details about what request does what as the whole draft process is taken care by the template and the framework. You can also find details in the odata service metadata as well. This is really very useful information. When I tried similar example I am facing error at draft table(When I create the CDS view the draft table is not created automatically and raising error saying DB table ZXXX_XXX does not exist in active version and if I create the DB draft table manually it is through different error :Active Entity DB fields not marked as KEY), I followed the steps provided here. Can you help ? Hi Gayatri, Thanks for the feedback. It seems you have already posted a question on this. I will reply there. You are saying “Standard BP Fiori App” means api which SAP is providing also have the same concept as above ? I didn’t see in the post the Deletion of the item, could you suggest please what changes and were to do them ? The draft creation/deletion is working properly, but after save of all the changes, the deleted items appear again, are not deleted from the ‘real’ custom table . 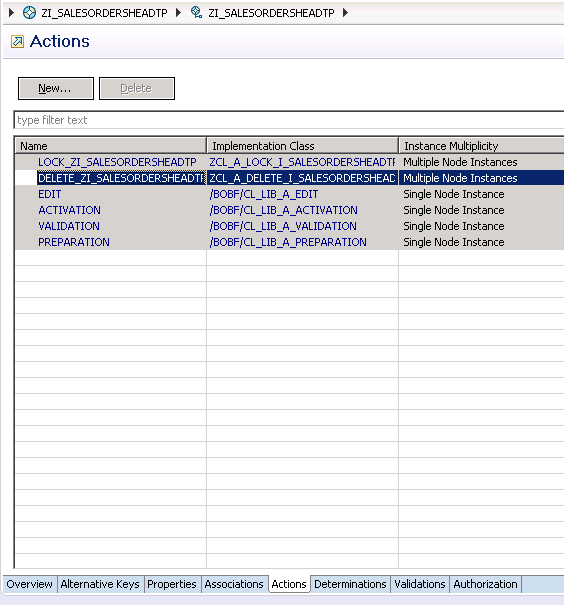 You need to delete it manually in the class that is available in the actions. There is an another blog which does that. The Header deletion is working, I’m having problem when deleting an item, from the second facet. Delete button removes the item from the UI list, but after saving the Sales order, the item appears again in the UI list on the second facet. I solved this by deleting the item from table during save draft, in method copy_draft_to_active_entity. Do you see any problem doing like this ? From my understanding you are right, I saw the same behaviour in the standard develied app as well, they are checking if the draft instance against the original data if the draft item is not available then they are deleting the original data. Thanks Mahesh, it was a very usefull blog. Thanks such a very well document on non-guid based Draft feature. Nice work !!. Very detailed explanation and easy to understand. I am looking forward to implement. I wanted to achieve the same locking mechanism in my custom fiori apps which are build using only SAPUI5 and odata (but no CDS). Is it possible to achieve this using BOPF ? Nice Blog. I was really looking for content something like this. I am also working on similar requirement where I am creating a BO for maintenance order where we don’t have GUID key in database. I have created my BO with all CRUD operations. Then I created Consumption CDS on top of BO CDS in which I am only going for UPDATE operation along with draft functionality. Annotation transactionProcessingDelayed is marked as true. Now when I created UI application, first screen is displayed correctly with all the filters and maintenance order list. But when I select a order to navigate to second screen for update, I am getting the error as shown below. The entityset in below URI is for consumption CDS only. Can you please help and suggest the issue here. Thanks Mahesh for this Nice article. I want to extend the SSP Purchase requisition Application. From Standard CDS view a draft table and BOPF object is geneated. When we are extending the standard CDS view the corresponding Draft Table is not picking up the new field. Awesome Mahesh! Worth the content to go through.. looking forward for more bolgs like this.